Larry has been busy and redesigned the bracket for the eBullitts for this coming year. It looks stunning in the flesh, incredibly elegant and shapely. It allows the engine to be even more discrete than previous generations. We have also beefed up the chainstay to improve stiffness and keep the torgue generated by the engine as direct in it’s power transfer as possible. You may also notice that we now have a frame split so that Gates Carbon Drive is possible. Behold! The 2019 eBullitt E8000 in all it’s glory! No, we still do not offer beltdrive for our eBullitts. Achieving the correct beltline, while using the Di2 electric shifting is still not possible. 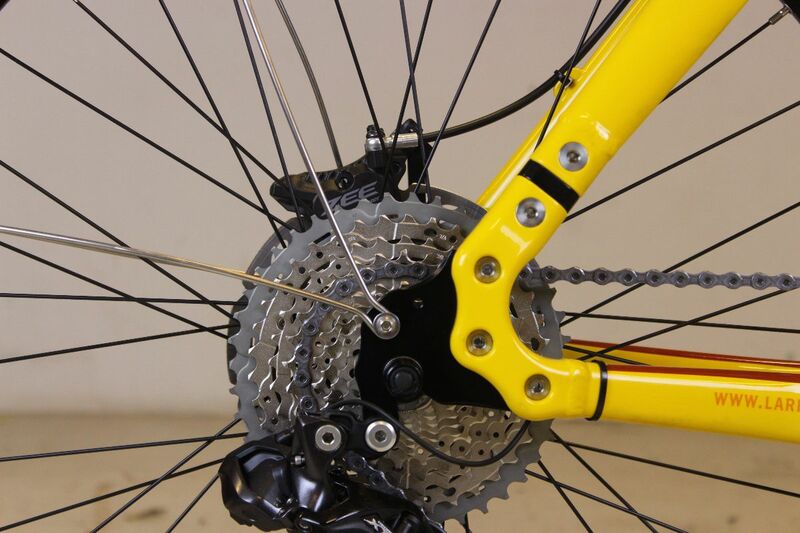 However, if a mechanical shifted rear hub is used, then beltdrive could be mounted. As we do consider the Di2 integration to be the heart and soul of the eBullitt, we still only build our eBullitts with chains. There are a few other spec updates worth noting for this year too. Firstly, we had a lot of feedback regarding gearing and some people felt the eBullitt E8000 was geared too low for flatter countries. We have remedied this by mounting a 44 tooth chainring and including a 38 tooth too if you live in some mad hilly alpine village and need some low end grunt. We have also specced a new bar, this new version is 750mm long and 15mm rise but has more sweepback than previous iterations which feels a bit better on the wrists and is way more comfortable. Lastly, we are just sticking to Schwalbe Marathon tyres on the eBullitts. They are ebike tested and ready and provide a good balance of puncture resistance, an acceptable wear rate and overall rolling speed. There are sexier, faster rolling tyres out there….but these work very well and once they wear out you can go get some tan walled disco slippers to replace them! Shimano Steps E8000 motor, the smaller and lightest on the market. We have stuck with XT Di2 for the rear shifting. It works, everytime! If it aint broke, don’t fix it! And we have also stuck with the 11-42 cassette as it seems to keep the majority of people happy. The jumps on the XT cassette between gear ratios isn’t too crazy either so keeps you pedalling a pretty smooth cadence. Always keep your pedalling smooth! You’ll look like your doing the Moon Walk! Braking has been a matter of discussion for us here in Copenhagen quite a lot. Making sure that a fully loaded eBullitt, complete with rider and human and tiny human cargo can stop quickly and safely has been a matter of priority for us. 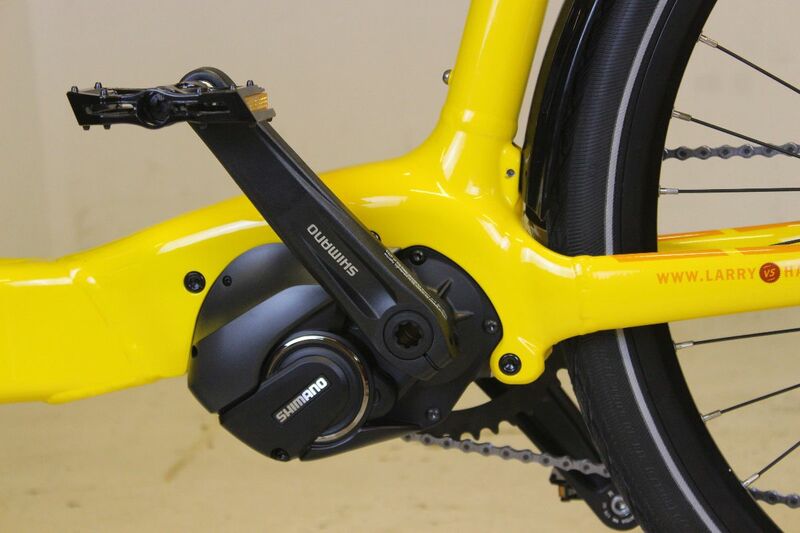 In light of that, we ended up putting Shimano Zee 4 piston brakes on the eBullitt E8000. These brakes are designed for downhill mountain bike racing and feature a 4 piston caliper, which essentially doubles the amount of brake pad contact on the disc brake rotor. This ensures that even in wet, grimy conditions you will be able to slow down incredibly effectively. It might seem a little over the top to go into all these details, but components are something we spend a lot of time discussing and even more timetesting thoroughly . We ride these things daily and in most cases, as a worthy alternative to using cars. The Bullitt must perform impeccably every day and do so year year. Components must function flawlessly and be simultaneously very durable. Frame: T6 heat-treated, 7005 aluminium designed for Shimano STePS e8000 motor. Fork: Chromoly steel with tapered steerer tube. Kickstand: Aluminium with replaceable feet. Headsets: 11⁄8” FSA Orbit XII , 11⁄2” tapered 11⁄8” . Steerer arm: Chromoly steel with machined fittings and rubber covered balljoint. Motor: Bottom bracket mounted for low centre of gravity and light; 2.8kg. 250W/70Nm Torque max output. Battery: High capacity, 504Wh and low charging time of 4 hours; 2.62kg. Rear wheel: Novatec hub, sealed bearings, 10mm axle, laced to Alex 36H Supra rim. Front wheel: Novatec hub laced to Alex 36H Supra rim. Handlebar: MJ Components, 750mm, 31.6 mm alloy riser bar, black. Stemlifter: EasyUp 100mm of adjustment, black. Bell: Brass Japanese Wind Bell, black. Saddle: Original Bullitt Racing Seat from Velo, black. Seatpost: MJ Components 31.6 mm alloy, 410mm, black. Front LightBusch Müller Lumotec IQ2 Eyc powered from main Shimano battery. Rear LightBusch Müller Secula powered from main Shimano battery. 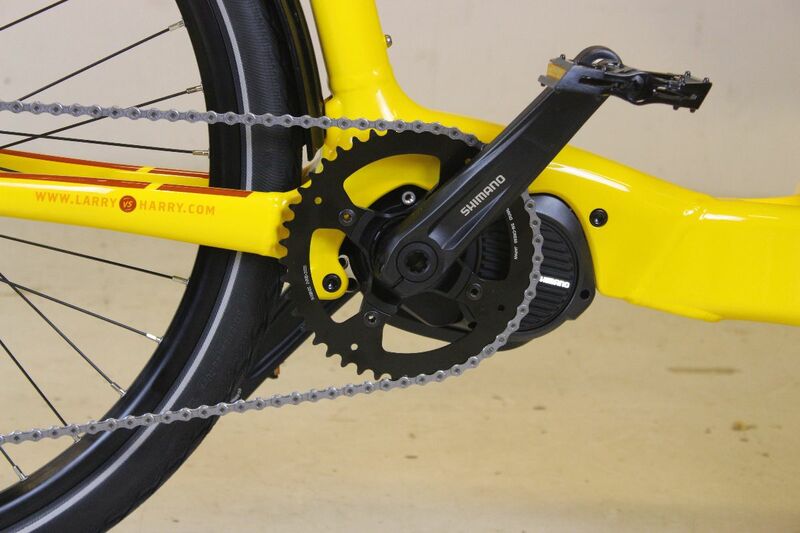 Chain: KMC, e-bike ready X11e EPT antirust. The beefed up dropout and frame opening. 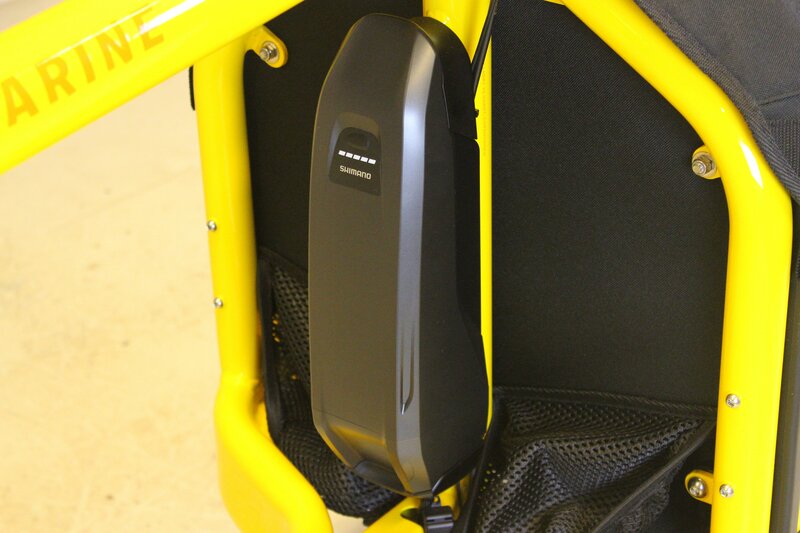 The E8000 series battery, snug and discrete. We are incredibly proud of our new Steps E6100 and E8000 eBullitts. 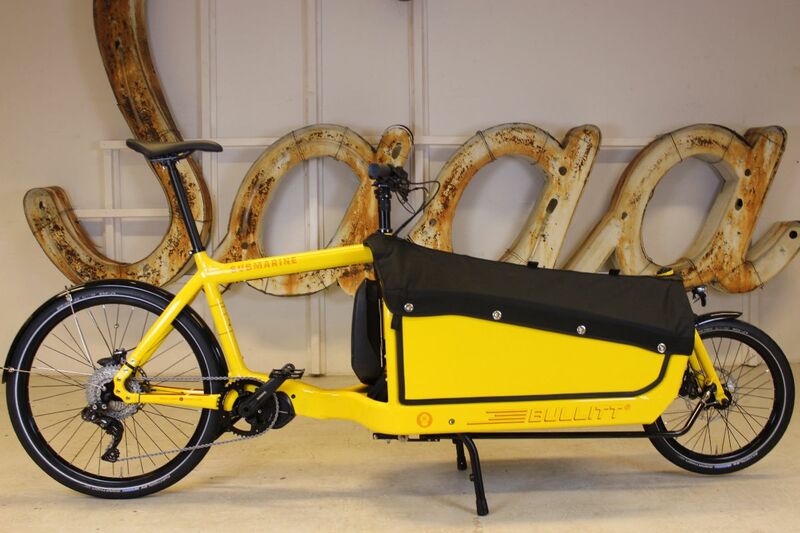 We believe they have again raised the bar for cargobikes in terms of both functionality and design. Form and function in pretty fantastic harmony. We hope you all like them too! ?